Whether it’s about re-sodding an existing lawn or installing a new one, sod installation involves much more than merely unrolling the sod. You need to consider several factors that are likely to influence the sod, such as base soil condition, exposure to sunlight or shade, maintenance, foot traffic, and lifestyle. Where your sod is coming from and the proper process of installation are crucial factors to consider for successful sodding. 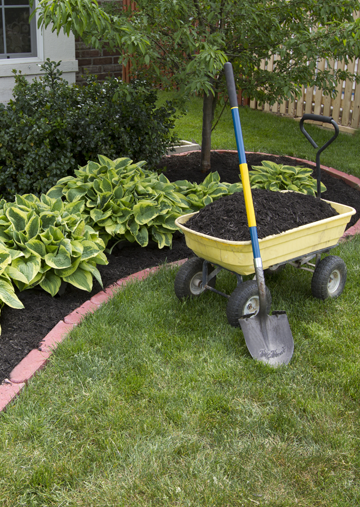 Beautify your plant beds while promoting plant health with our outstanding mulch installation services! The role of mulch is more than merely offering a neat look to your landscape and providing ground cover. The mulch quality and mulch depth have a significant impact on the plant root systems in the garden beds. Mulch has the ability to limit evaporation by retaining more water in the soil during hot days. This benefits plants that have delicate root systems. Additionally, mulch prevents plant roots from freezing in the cold winter days. Mulch, of different varieties, offers various pest protection benefits. You need to choose a mulch that makes your landscape more appealing and completes its overall look. Go Get Em Lawn Service provides you excellent sod and mulch installation services. We offer you fresh sod and high-quality mulch that makes your lawn manageable and beautiful for years. Our lawn care professionals are skilled and well-experienced in accomplishing mulch/sod installation jobs efficiently and in a hassle-free way. We are well-known in Jacksonville and the surrounding region for our superior customer service and timely completion of work. Our services leave your lawns and gardens smooth and beautiful. We have many loyal customers who were impressed with our excellent quality of mulch and sod installation. Get in touch with us today to avail our expert sod and mulch installation services!